A premium valuation, an empty bench in gaming, and uncertainty over next year's "Ant-Man" could take a bite out of Disney stock. Guardians of the Galaxy is in its third week at or near the top of the box office. Credit: Marvel Entertainment. 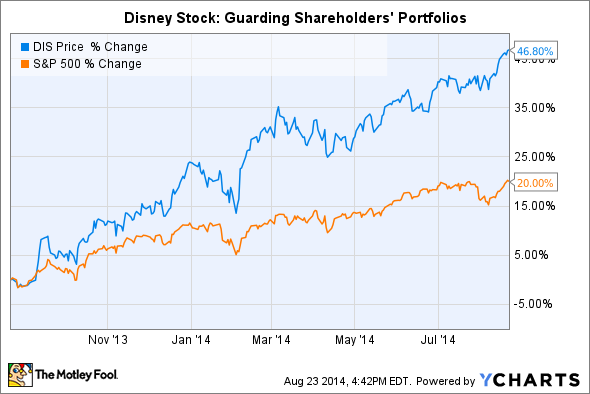 Can anything derail Disney (NYSE:DIS) stock? Not judging by the recent earnings report or box office tally. Guardians of the Galaxy is on track to end the weekend as the top summer film at U.S. theaters, according to The Hollywood Reporter. These factors and more have pushed Disney stock up over 40% over the past year, to better than $90 a share. There's much to like about Disney's business right now. Existing (e,g., The Avengers) and new (e.g., Frozen) franchises are pushing revenue, profits, and margins at the Consumer Products group to new highs as theme parks get more automated for serving large, deep-pocketed crowds. Companywide operating margin has improved in each of the past four quarters as a result. So have returns on equity and capital. 1. Valuation. Disney stock now trades for north of $90 a share and 23 times earnings. That's anything but a cheap multiple. Look at Time Warner (NYSE:TWX.DL), a close peer that trades for 17 times earnings. Disney's comparative outperformance last quarter -- including an 8% revenue boost versus just 3% for Warner -- accounts for some of the premium, but what happens when growth slows? (And it will, because it always does.) There's little room for error at this valuation. 3. Ant-Man may disappoint. Edgar Wright stepped away from Ant-Man three months ago after spending eight years working on the project. Fans I've talked with are cautiously optimistic that Paul Rudd and Michael Douglas can pull off another win for Marvel Studios, but a lot depends on how well director Peyton Reed and writer Adam McKay get along. Reed's comments to reporters at last month's Comic-Con appear promising, but a lot could go wrong between now and July 2015, when the movie is scheduled to arrive in U.S. theaters. A scrappy-looking Rudd plays the titular role in next year's Ant-Man. Credit: Marvel Entertainment. Disney has been a holding of mine since early 2010, when the Marvel Entertainment shares I purchased in 2008 converted to Disney stock. My hope is to never sell. Between Lucasfilm, Marvel, and Pixar, and its own internally developed properties, Disney is home to what are arguably the most lucrative franchises in entertainment. But as an investor, I also can't ignore the risks. The stock isn't cheap at present levels, gaming is a wild card, and creative changes could hurt Ant-Man at the box office. Any of them of could stall momentum and cause Disney stock to fall from recent highs.